Club night this week provided us with a talk, supported with prints, on black and white images, made using film and process development in the good old dark room. The talk was by Dave Butcher, a recognised professional photographer in this, dare I say, now increasingly rare method of producing images. 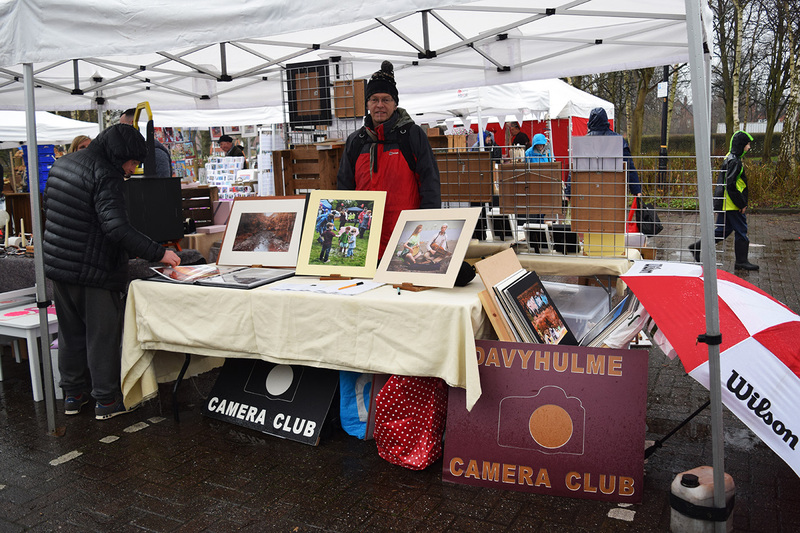 Dave has retained the skills for this and uses medium format film cameras so his images are of excellent quality and his preferred photographic paper is by Ilford. I’m sure many of the club members listened with a hint of nostalgia as Dave reminded us of equipment we have not used in decades and of the excitement as an image appeared slowly on the photographic paper gently floating about in the developing tray. One truism of photography before the digital age was, composing images with greater time and attention to detail, simply because of the limited number of available images on a roll of film. 8 or 12 on 120 film stock and 24 to 36 on 35mm. From Dave’s talk we gleaned just how much attention and composition he puts into each of his shots and this came through in his final prints on display. For anyone out there interested in this format, he runs training courses. here is another image of our stall at the Artisan Market held last Saturday in Urmston.